However, the price of such beauty is high. Remote and previously secluded areas that we visited, such as Railay Beach and Maya Bay, are becoming increasingly popular. With such popularity comes new challenges, such as what to do with all of the trash from the hordes of tourists that come for day trips. Also, there is a remarkable amount of pollution, as the seemingly idyllic long-tail boats all have engines on the back, complete with exhaust pipes that expel puffy clouds of black smoke, making even the nearest islands appear foggy in the distance. The humming of engines revving is persistent, and relents only with the setting of the sun. But despite all of this, it's easy to get lost in the beauty that is southern Thailand. 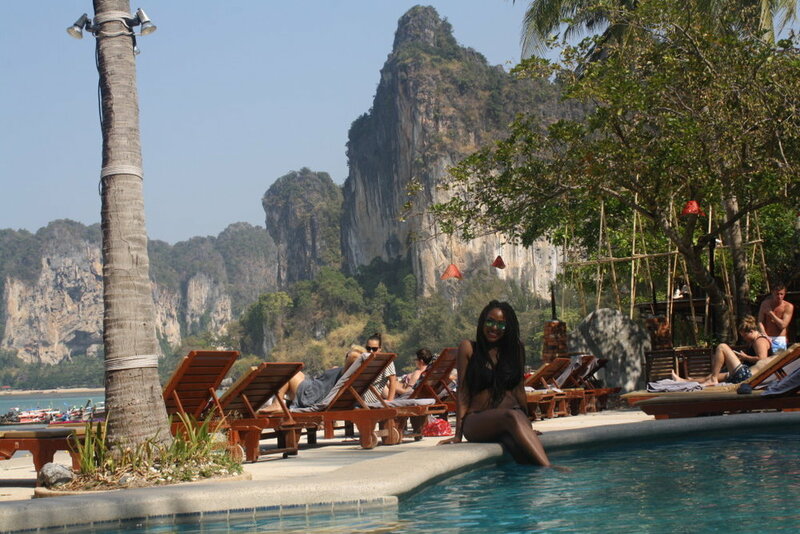 Our first stop was Railay Beach in Krabi. It is accessible only by long-tail boat and involved us walking in up to thigh-high water to reach our beachfront resort. Railay Beach truly has some of the most picturesque views I have ever seen. We then took a ferry to Koh Phi Phi, and we departed for Maya Bay from Koh Phi Phi. The pictures of Maya Bay do no justice to the towering giants that guard the Bay from waves and any care in the world, really. Wading through water to arrive at our resort on Railay Beach. View of both Koh Phi Phi Don and Koh Phi Phi Leh from "Viewing Point"